Points Nécessaires : 33 Please note that, for now, you cannot download content from our platform directly onto a mobile device (phone, iPod, iPad, tablets...). You need to download your items onto a PC or Mac, and then transfer them onto your device in the normal way. We are working on allowing direct downloads to mobile devices but this is not possible in the current version of the platform. Sorry about the inconvenience! Runtime: 34 minutesDo you know how much the most expensive bottle of wine ever auctioned sold for? Or how the production processes of red and white wine differ? What should you be doing when a waiter hands you a cork? And what is the difference between an aroma and a bouquet? 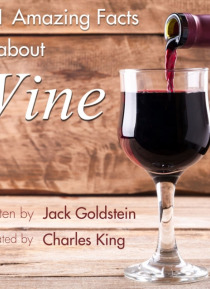 Charles King reveals the answer to all these questions and more as he talks us through over one hundred amazing facts about… wine.